12 String was not on my list when I planned out the area but I arrived there thanks to some people I met at Selkirk Abbey. They had some excellent beers in a wide variety of styles. My very first beer in the taster flight was the passion fruit gose, one of the most balanced fruited gose beers I have had. It is balanced in that the fruit doesn’t overpower the complexity present in the base beer. The beer had a mild tart kick to it and an overall nice balance of flavors. The Jam Session IPA was a balanced IPA with lots of fruit and citrus notes, fairly standard. The C# #5 IPA had tons of pine and fruit from the hops but a bitterness that dominated it too strongly. The Rye IPA was malty with barely noticeable citrus hops and a good rye bite, fairly average. The Double Drip Imperial Stout was thick and mildly smoky with tons of roast and coffee. My husband really enjoyed this beer and we ended up bringing a 32oz growler home with us and giving one to my uncle the following day. Really excellent beer. 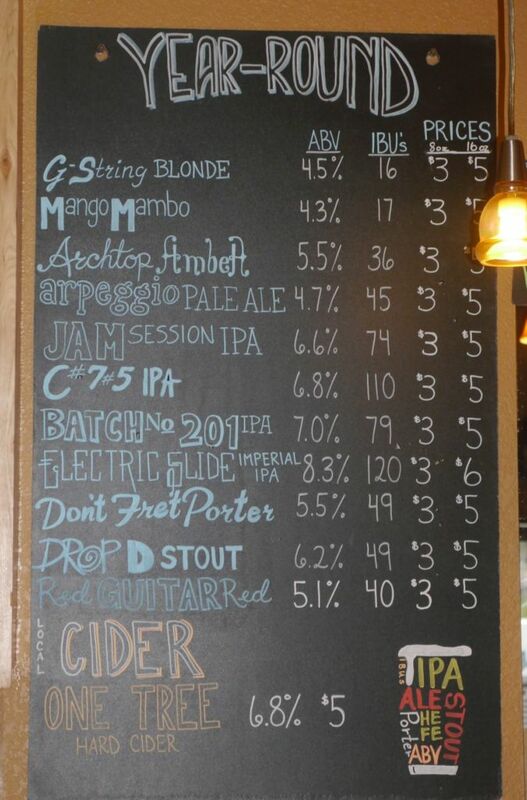 The electric slide Double IPA was the best of the IPAs with tons of citrus and super smooth overall. Iron Goat came highly recommended and I thought that all of their beers were very well done. They have a large tap room that is also a restaurant and it was busy but not overly so when we visited. I had a large flight of varying styles but focusing on the sours, IPAs, and farmhouse offerings. The Farmhouse ale was quite solid with a nice mix of spice and a good dry finish. The Rhubarb farmhouse was a tasty twist on the base beer with a good bite from the rhubarb. Both were very drinkable. The cherry sour was smooth and fruity and moderately juicy. At first it didn’t seem very sour but it got a bit tart as it warmed up. The blackberry apricot sour was my favorite of the bunch with lots of jam and a good tart finish. All the flavors blended very nicely. The headbutt IPA was super floral and piney with a strong bitter finish. This is a great beer to order if you love pine hops in your IPAs. 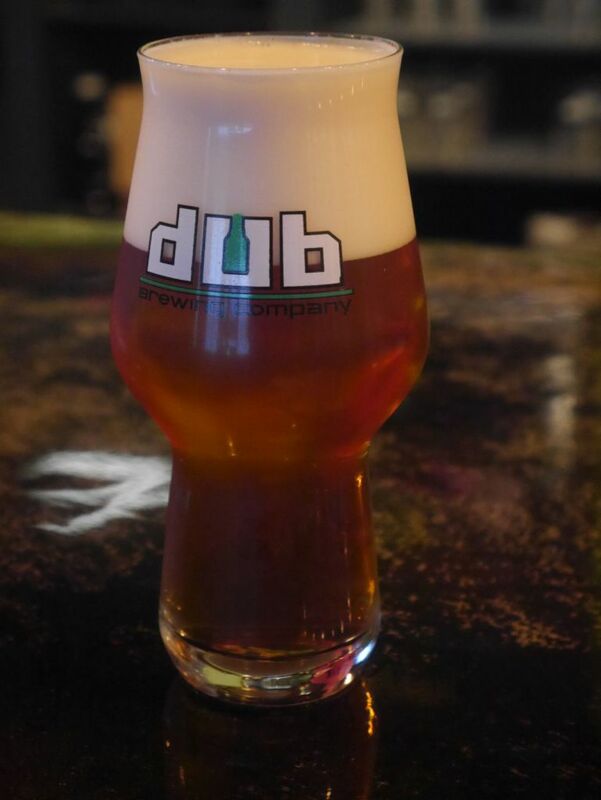 The Impaler double IPA was balanced with dank citrus notes from the hops and a smooth caramel malt backbone. This was also a very tasty beer. 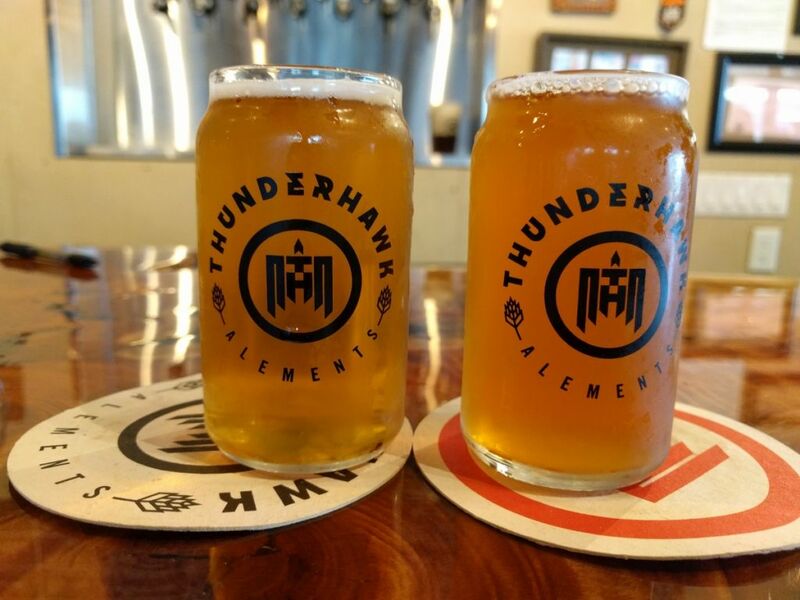 Thunder Hawk has been in the planning stages for many months before finally opening in the crowded Miramar area of San Diego, which already houses over 10 breweries. Some would argue that it is growing too fast for the demand, and we will soon see if all the breweries can survive. 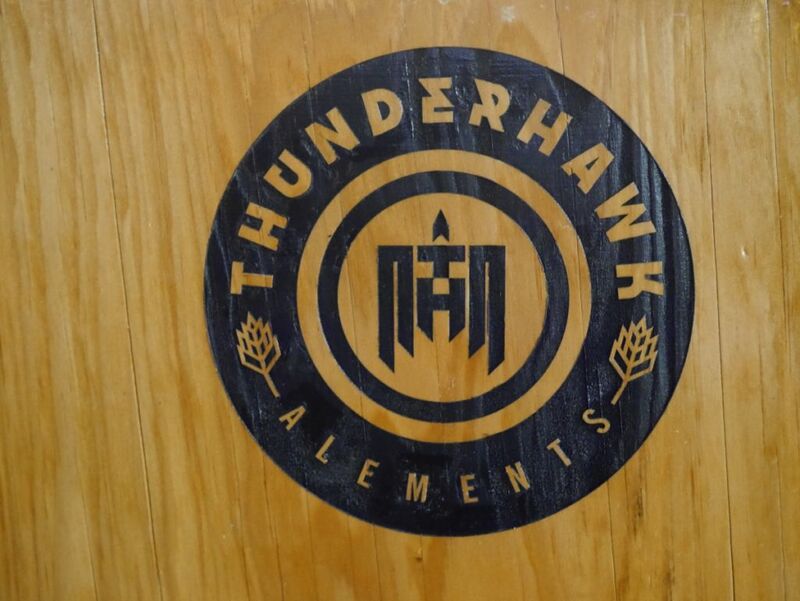 Thunderhawk came in with a lineup of beers that are different from the usual style for the area. They aren’t following the trends but are instead making beer in a classic style. When I first visited the brewery in the first week of November, 2016 they had only four beers on tap because they have been selling their beer faster than they can brew it. On tap were an ESB, two pale ales, and a saison. The saison is also usually available in a version made with local pine needles. They also brew a popular double IPA and dopplebock. None of those beers were available at that time which is a good sign for them. An earlier version of their menu suggests that they consider the pale ales to be “West Coast Style.” I disagree with that but that doesn’t mean they are bad beers. One of the pale ales is made with more typical piney hops. The other is made with mosaic and citra, both known for their fruity and citrus character. Both beers were classic style with a balanced malt backbone and an underlying bitterness. I didn’t think the mosaic and citra beer tasted like I expect from either of those hops but it was dank, balanced, and clean. The Westworld pale, the piney of the two, was a bit herbal but still similarly balanced, dank, and not too bitter. These beers don’t have the same flavors everyone else around town is chasing with the juicy IPA craze but this gives them a longer shelf life and the flavors will stick around longer. The ESB initially was not a beer I could be very positive about. I got a lot of notes of overripe fruit from it and not much apricot or caramel like I would expect from the style. A friend of my mom’s who joined us at the brewery that evening was a huge fan of this beer though. She enjoyed it more than any of the other beers and didn’t taste the same flavors as strongly. Thankfully this seems to have been an issue with that batch and newer batches have come out much better as described below. Great outdoor seating area for the warmer months. The oak aged saison was my favorite of the evening. With both ginger and honey I was worried that either of the two flavors would overpower the rest of the beer. Thankfully, everything was perfectly balanced with the ginger sitting in the back and the honey adding just the right amount of body to the beer. The oak gave it a fantastic smooth finish. 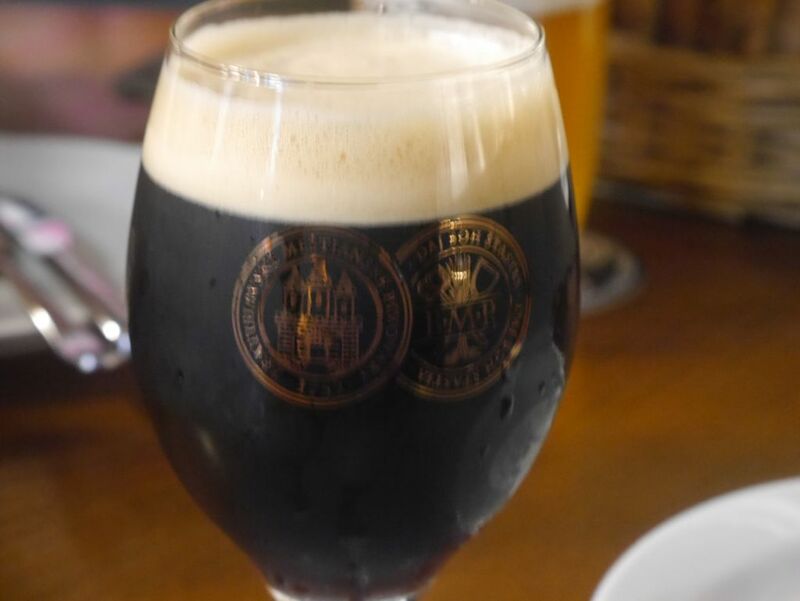 I came back a week later and their Dunkel was on along with their vanilla stout. The Overture dunkelweisen was smooth and balanced with notes of caramel and burnt toffee, an impressive beer and one of the few San Diego versions of the style I can drink. The Rise of Zemunda stout had tons of vanilla with some mild chocolate. It was very flavorful for a low alcohol stout. For my third visit before this post, I stopped by November 23 and tried their ESB wet hopped with Brewer’s Gold hops, regular ESB to compare, and the Punt Gun IPA. The Wet Hopped ESB was very tasty and had a nice mix of caramel malts, mild hops, and some mild coffee notes in the finish. This was so much better than my experience with the regular ESB that I asked for a splash to compare and the overripe fruits I had a problem with earlier were all gone. Their ESB is now a very enjoyable beer. The Punt Gun IPA has a ton of followers online but I hadn’t been able to taste it until today. I can see why. It is a really clean balanced IPA with notes of mango, apricot, an,d other tropical fruits with a mildly sweet finish. 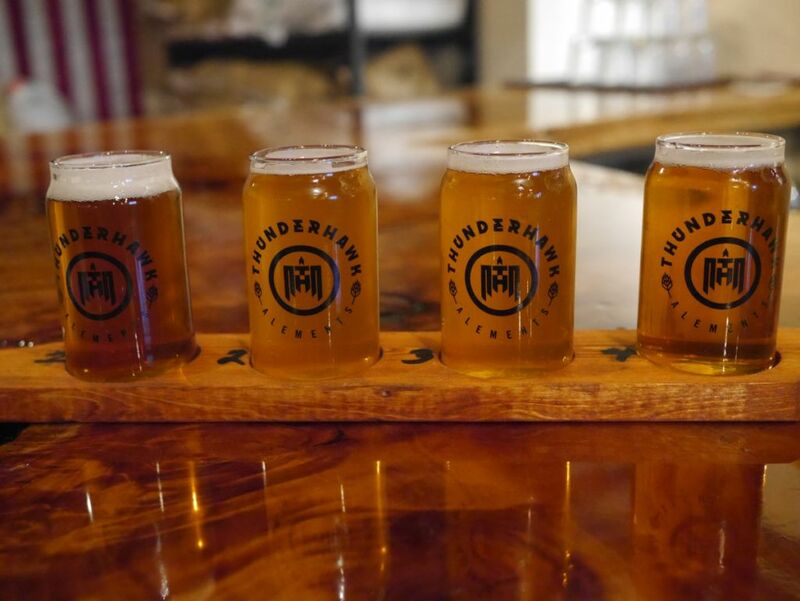 Thunderhawk has a gorgeous interior with lots of wood accents and a beautiful outdoor space that help set it apart from the rest of the breweries in the area and will go a long way towards bringing more people inside. Based on my repeated visits, i expect any issues I had with early batches will be remedied shortly. The excellent beers I have tried show me that the brewer will soon dial in any beers that aren’t quite there yet. 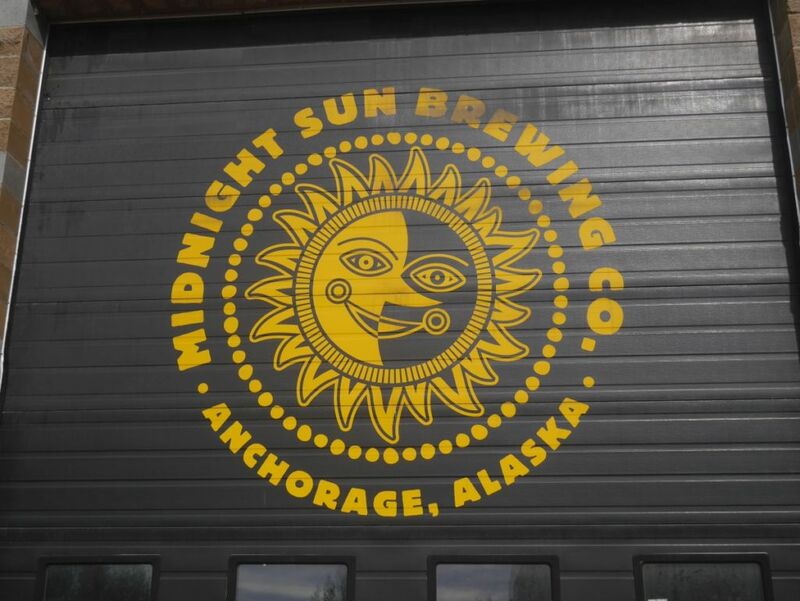 It is fitting to start a post about Anchorage breweries with Midnight Sun because from what I have been told by the locals, the brewer who now brews all the beers at Anchorage brewing was originally at Midnight Sun. These two breweries are fantastic to hit although you may find the on-tap selection at Midnight Sun somewhat lacking like I did. They make up for this with their bottles available to-go. Midnight Sun is a brewpub so they have food and serve brunch on the weekends, making it a great first stop once you arrive in Anchorage if you already need a beer. Depending on how far you traveled to get there, you will most likely be ready for a beer immediately. 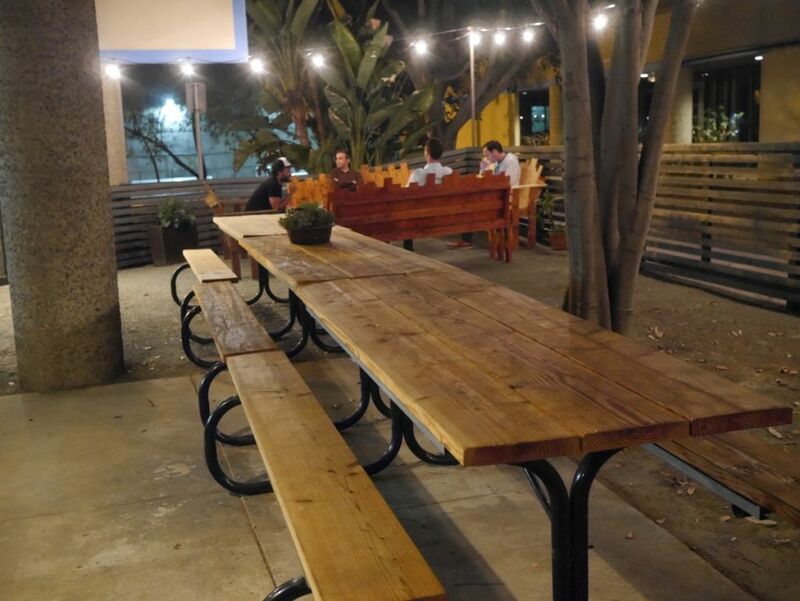 The brew pub has ample seating and a wide tap list. 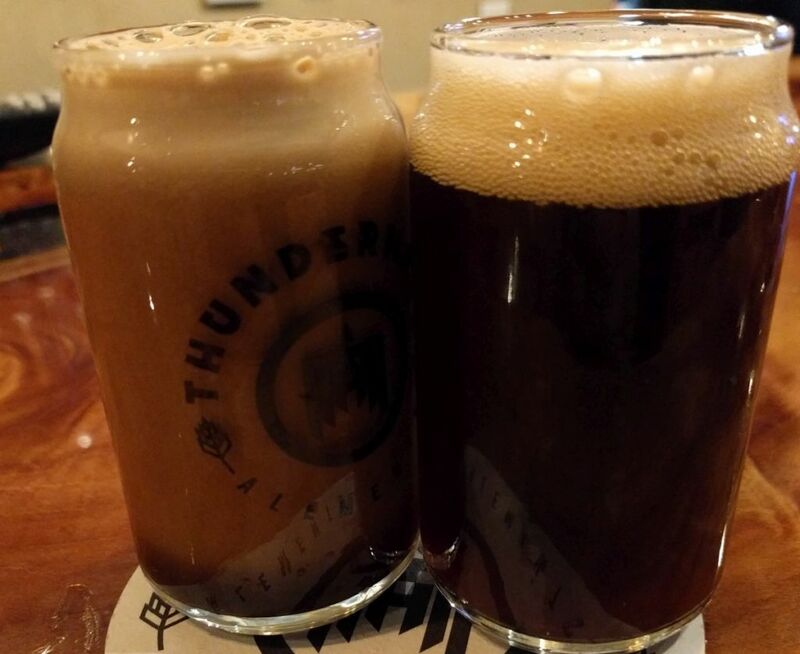 Though the items on tap were not of the sort that blew me away, no imperial stouts or sours on tap, the beers I did get to try were well-made. Since flights are limited to specific sets of beers, we ordered half pours of everything, which was plenty. In total I tried the Alt Bier, Coffee Porter, Pleasure Town IPA, and Imperial Pumpkin Porter. The alt bier was quite fruity and super smooth and clean. I could easily see myself going through multiple pints of this. The coffee porter was smooth and mild and quite light bodied. It could have used a bit more coffee kick but it was done well. The pleasure town IPA was quite bitter and dank balancing the three hops nicely with the occasional citrus or tropical fruit coming through. Overall I thought it was just a tad too bitter such that the aromas got a bit overpowered. Still it is a solid IPA and one you can’t go wrong with bringing with you on a hike. The imperial pumpkin porter had a ton of dark fruit from the malts and lots of spice. It was thankfully not made overly sweet. To me the spice was a bit overpowering of the rest of the beer as is common with this style. I left the brewery with a number of bottles to bring home and have already opened two of them. The wine aged brett pale ale was quite delicious. The other imperial stout was well-made but pretty solid. I am excited to try the Berserker bottle I have in the cellar as well. Anchorage Brewing is one of the few breweries that completely lived up to the hype. Though they only allow you to order full pours of beers, which made me come back two days in a row to enjoy everything, everything was very well made so I didn’t mind this at all. 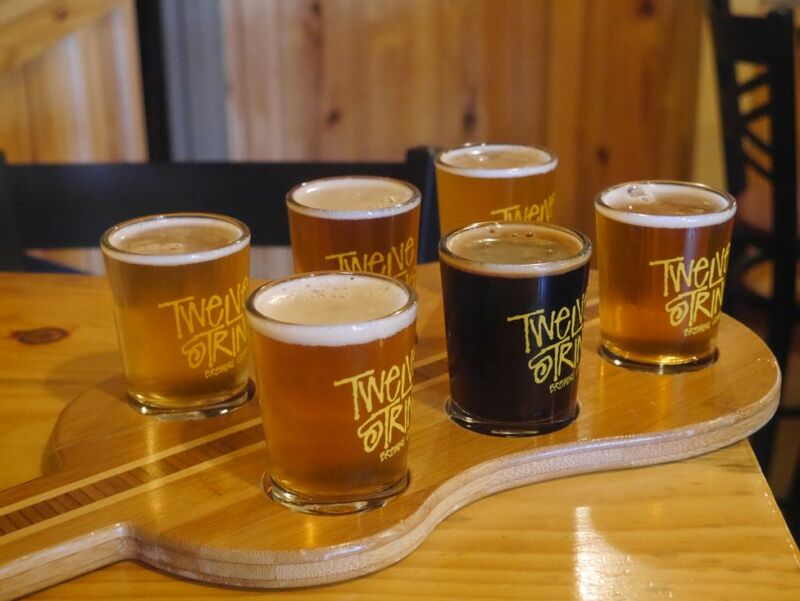 The tasting room has no food and tends to have close to 10 beers on tap at any given time. Because no tasters are served they are fine with giving you a few splashes. 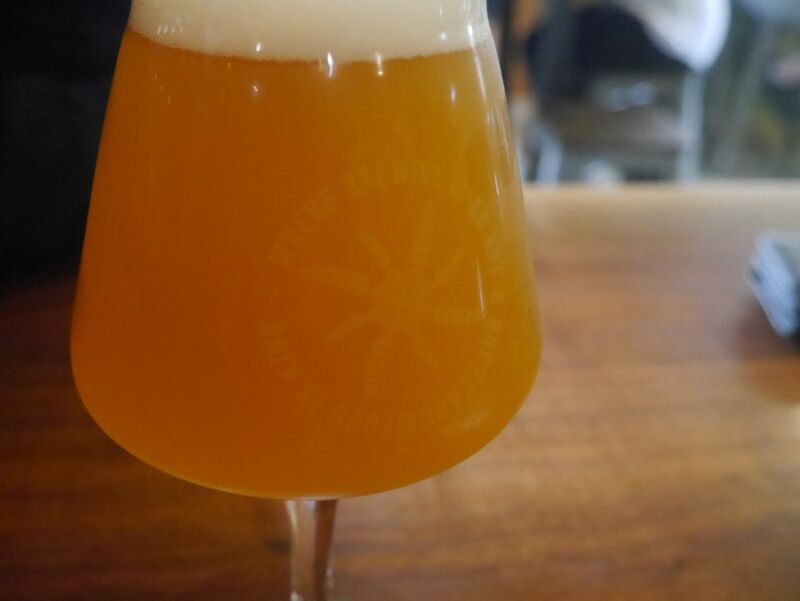 I started with the Migrating Eyes brett saison. I found it very smooth and funky with a nice tart kick. The anadromous dark sour was a nice mix of jam, vanilla and oak, and was quite smooth. My husband went straight for the darkest hour imperial stout. It had lots of molasses and caramel and was super smooth. Despite being 13% it wasn’t very boozy. He loved this one so much that coming back the second day he didn’t mind ordering it again. 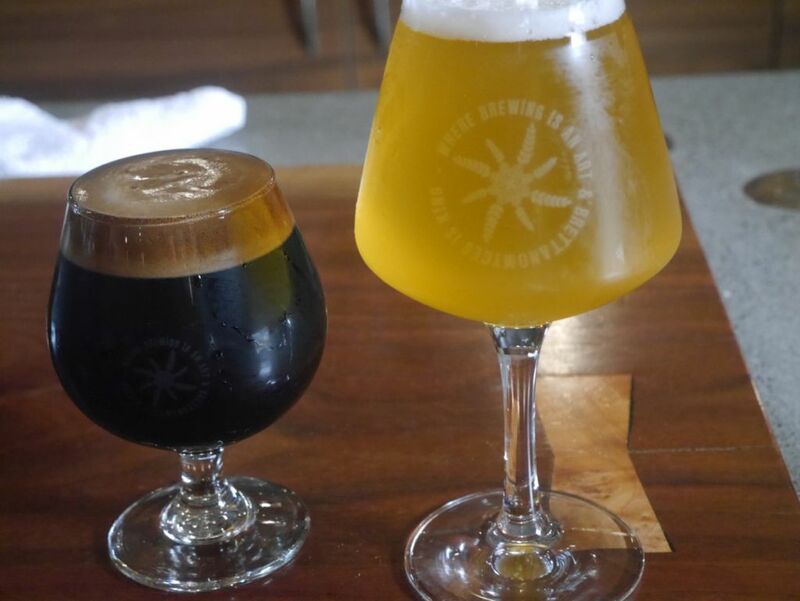 Brett saison and Imperial Stout. The triple IPA they had on tap was absolutely delightful. The beer was smooth and juicy with a bright orange cloudy color. Flavors included lots of citrus and mango. I ended up ordering this a second time the second day after trying a few others. When I came back the second day I tried the single IPA, which was well-made but didn’t have the same intense flavors of the double IPA. The Bitter Monk, was a delicious brett-forward Belgian double IPA. It had the right mix of bitterness, brett, and Belgian yeast. I also left Anchorage with a number of bottles because they have quite a wide range of beers available to bring home. Anchorage Brewing is one of the most exciting breweries I have visited and is a great way to spend a few hours if you happen to be in town. Though they tend to focus on sours and tarts they do hoppy beers well and their imperial stout was quite impressive. Though I did visit a couple of other breweries in town for a few beers, these two were the most excellent and would be worth planning a trip around to visit. Though both breweries do distribute to San Diego, you may find a few bottles at the breweries that you can’t find down here. 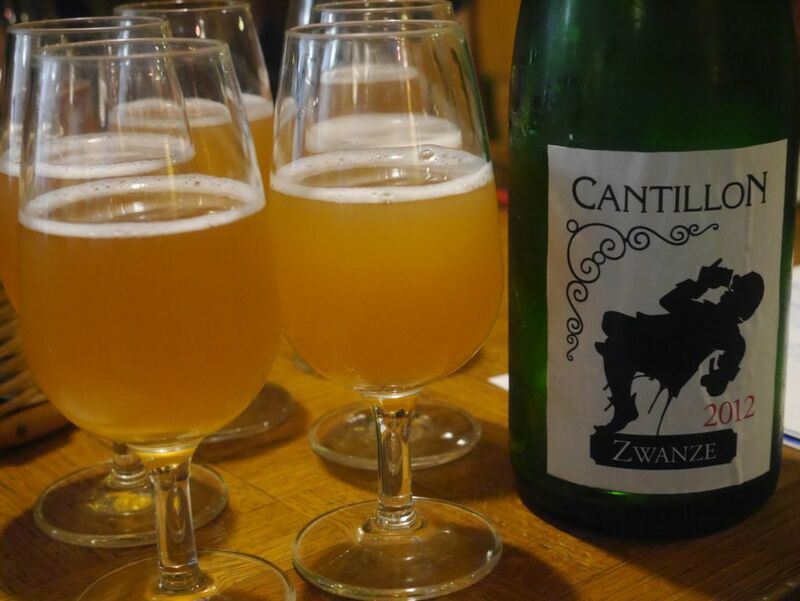 As a sour fan, Cantillon is considered one of those places that you need to visit at least once. After spending half a day there with great company I totally agree. 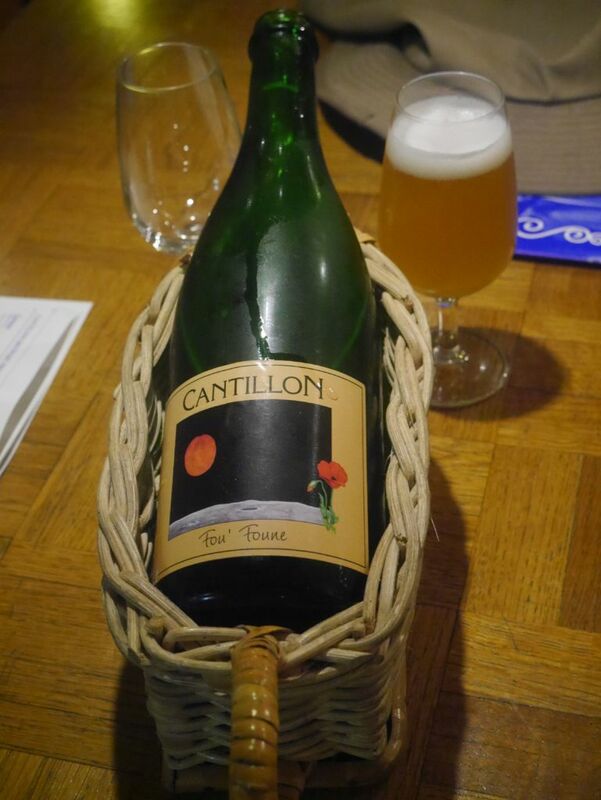 Getting to Cantillon is pretty easy. The metro drops you off a short distance away from the brewery so you don’t have to walk too far. The tour is short but worth paying the 7 euro fee (cash only) for because of the tasters you get after the tour is finished. The real fun comes when you start sharing bottles of archive beers with the various people around. Ideally you should gather a group of five or six people to share bottles with so that you can each buy one bottle and you can all share beers. You will have to buy bottles for on site consumption with cash only. I ended up getting together a group of six people and we each bought one bottle to share with the group. We started with the Fou Foune, a delicious apricot beer. 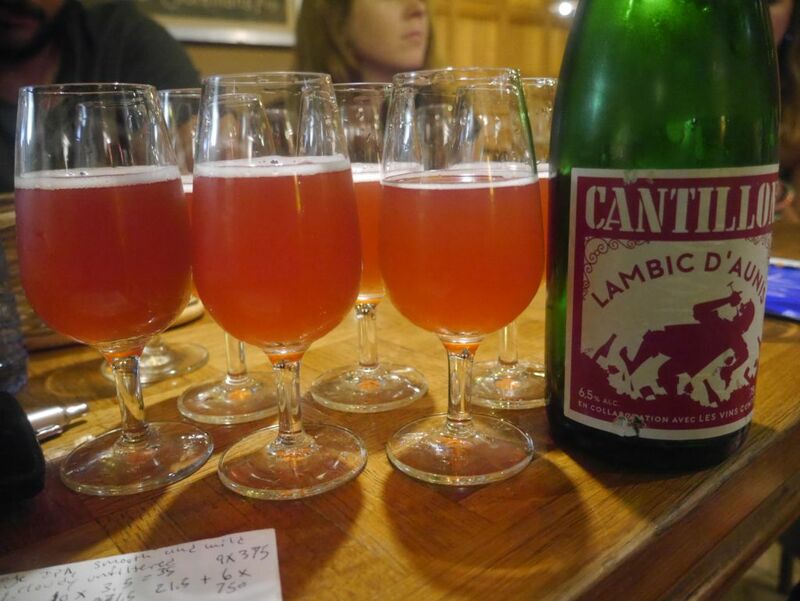 If you are lucky, Cantillon will have something unique and interesting on the to-go bottle list besides the standard Gueuze (a blend of different aged lambics), Kriek (brewed with cherries), and Rose de Gambrinus (brewed with raspberries). 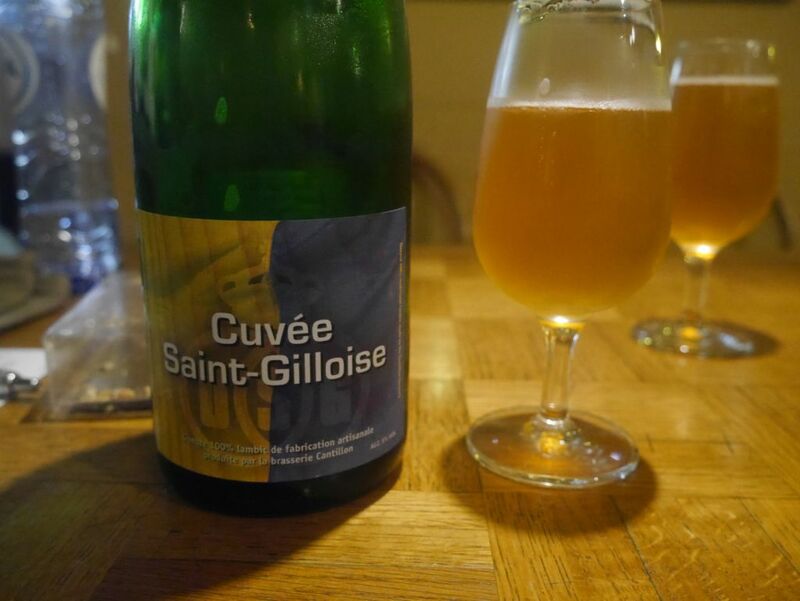 When I was there they happened to have the Cuvee St Gilloise, a dry-hopped lambic as well. The prices for beer to go are very reasonable. The 375ml bottles are 4 euros on site and the 750ml bottles are 7 euros. The beers are packaged in cardboard holders that don’t have the strongest handles so if you choose to leave with more than 6 bottles, you should take a cab back to your hotel to avoid breaking. Even then, some of the handles started to break by the time I got up to my room. If you can, bring two large cloth shopping bags with you so that you didn’t have to worry about the handles breaking on the way to the room. 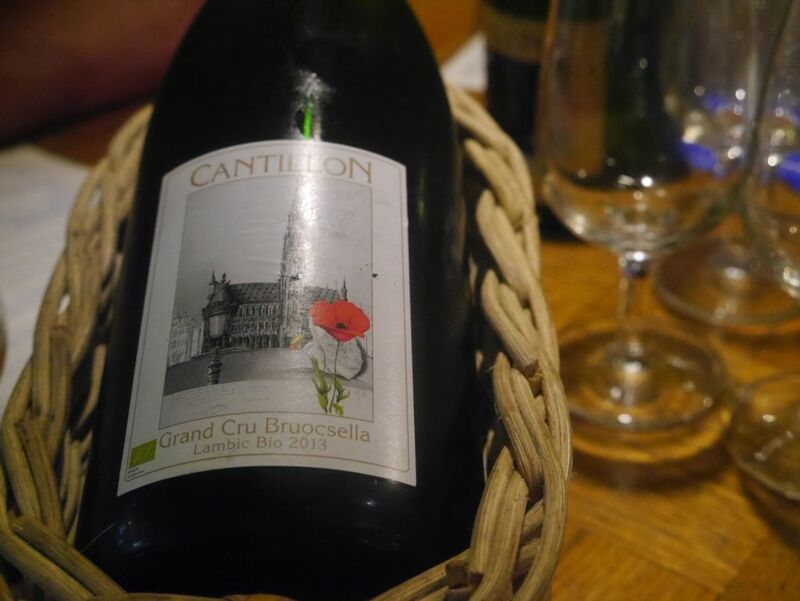 It is worth the trip so that you can bring back plenty of bottles to enjoy at home. 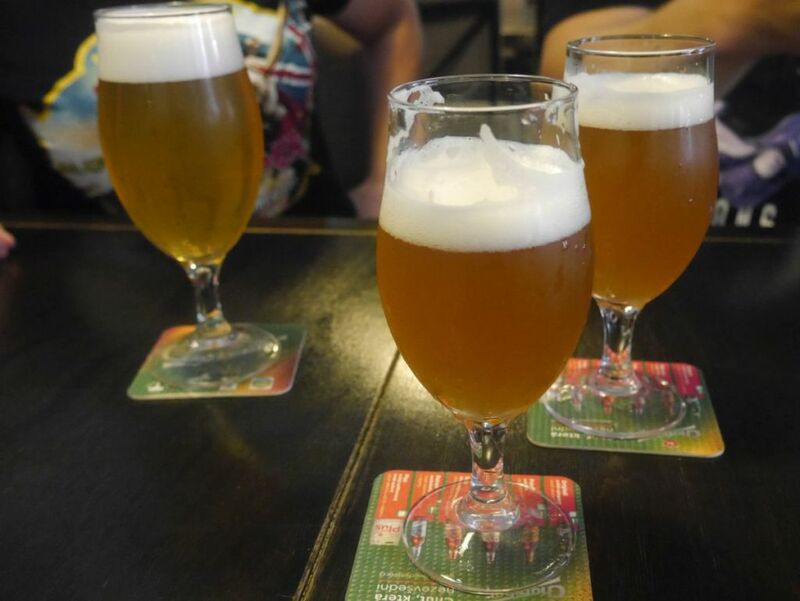 The beers are much less expensive on site than they are if you find them in other places outside of Belgium. The group I joined when I was at the brewery. If you don’t stay to taste at least one bottle on site, it might seem like a waste of time to come all the way out to visit. Many reviews from people who came just for the tour expressed this view. Keep in mind as well that they are only open from 10AM to 5PM and they sell the last bottles for on site consumption at 4:15 so you should plan to get there shortly after Noon, after a hearty lunch, if you want to make the most of your experience. 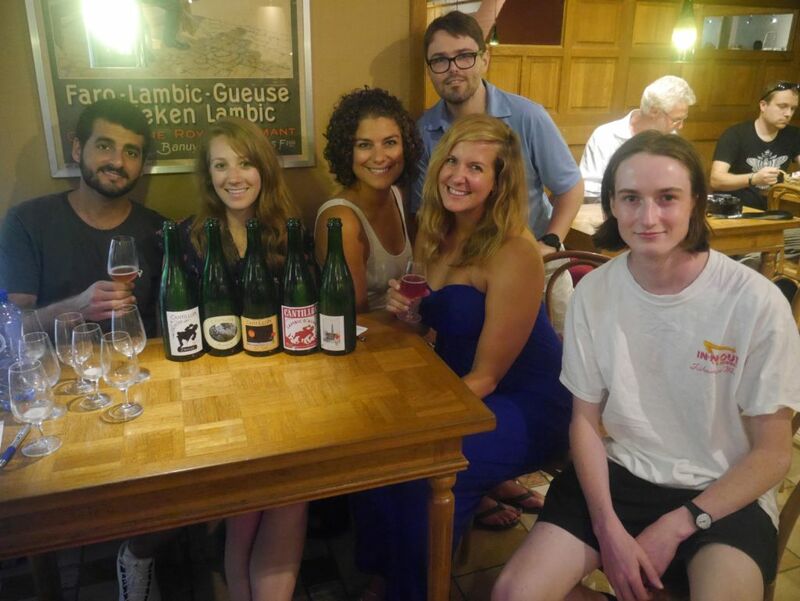 In general the people who arrive earlier in the day are at Cantillon to try as much as they can while they are there so you can easily get a share going. Of the bottles we shared, the Fou Foune (brewed with apricots) was the agreed upon favorite. I also really enjoyed the grand cru. All the bottles we finished. 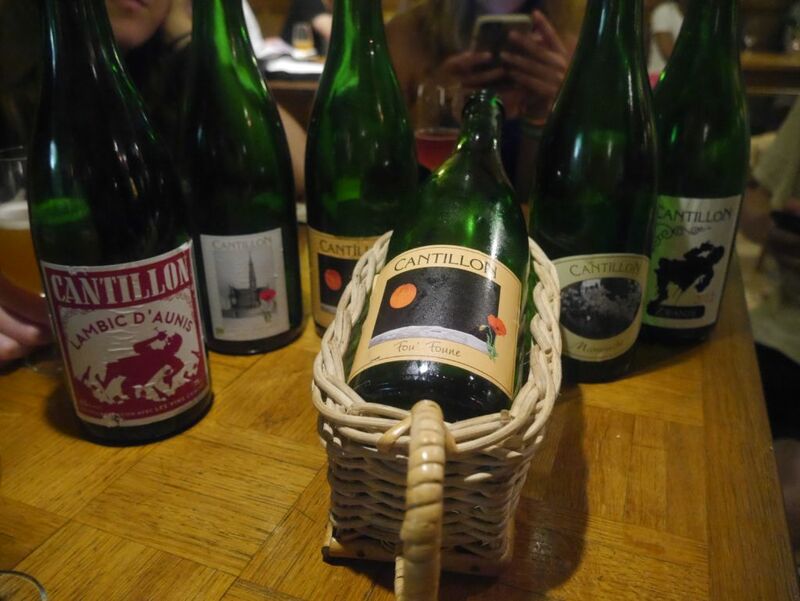 Visiting Cantillon was everything I expected and it was a great time hanging out with the group of people I shared bottles with while we were there. The crowd appeared as Cantillon was about to close so those people could only do the tour and weren’t able to try any bottles. You should also make sure you enjoy sours before making the trip so you know what you are getting into. 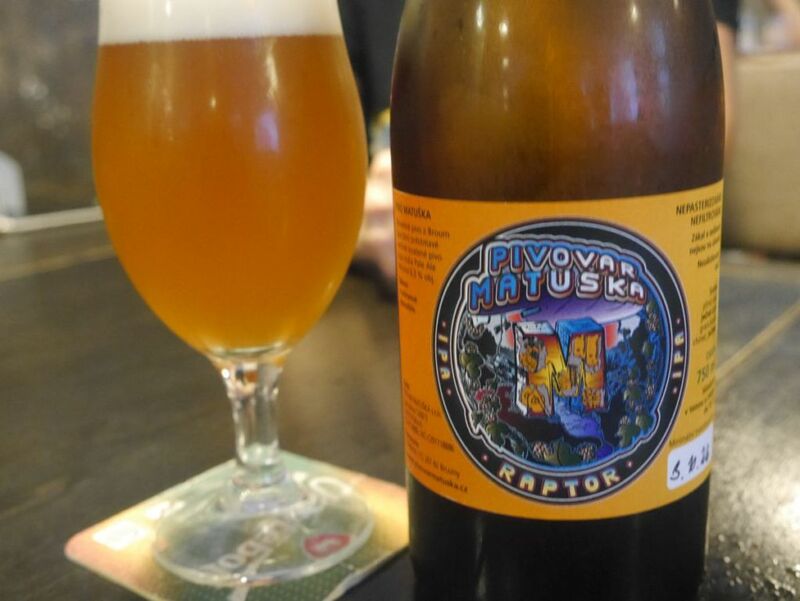 I spent about a week and a half visiting a friend in Bratislava, Slovakia and visiting a few breweries and local bars. I got the feeling that the craft beer scene is just getting started. While there are a few bars with craft taps, there are a handful of actual breweries you can visit directly. I encountered numerous consistency issues where beers that my friend recommended highly turned out tasting bland or worse. Some locals tell me that Poland is far ahead in that area and other friends regularly visit Sweden for the craft beer scene. Still, I had some great beers from a few local spots we visited and one local IPA from a newly opened DUB brewing that was close to the American style because the brewery is run by an American. 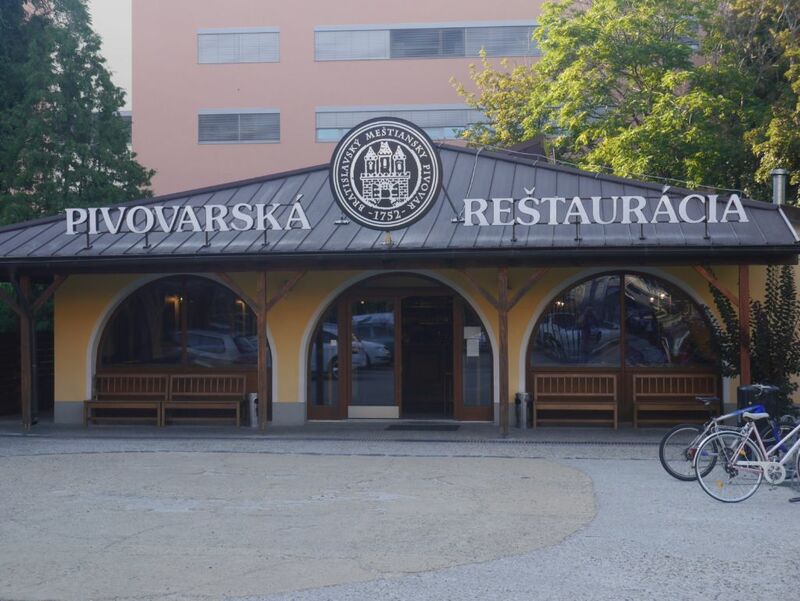 Our first visit was Mestiansky Pivovar, a brewery and restaurant that has a sign on the front saying it has been around since the 1700s though my friend tells me the exact spot has only been open for five years. They serve delicious food and it is the only place my friend regularly eats outside the home. They have two lagers, a cloudy pale lager and a smoky dark lager. Both are delicious though I prefer the pale one. This particular batch was quite fruity and had a nice medium body. The spare ribs there are served in a massive portion and are some of the best ribs I’ve had in my life. Out of the whole trip, the lager here was one of the most outstanding. 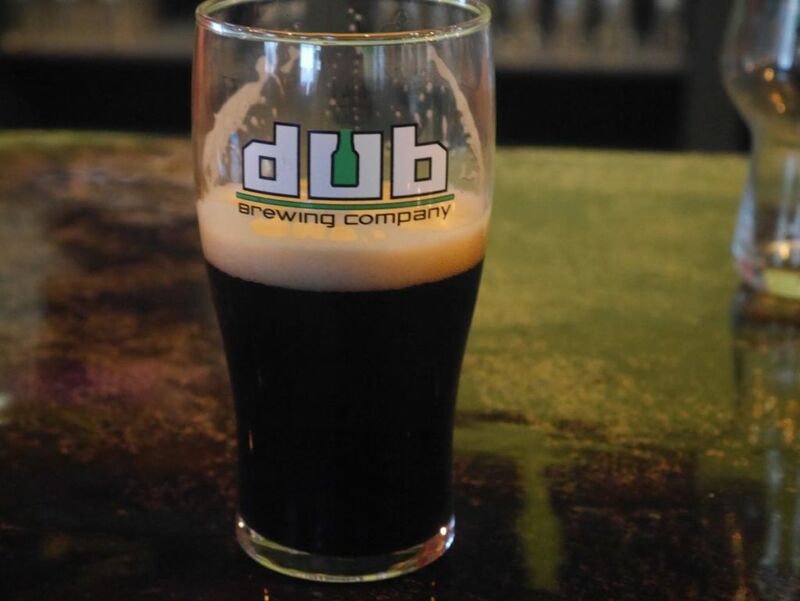 A bit later we visited DUB Brewing. It was in soft opening phase at the time of our visit but has since had its grand opening. The brewery is run by an American from Colorado who previously ran a successful brewery called Bonfire Brewing in Eagle Colorado. His ipa reminds me of home, delicious and balanced with a hearty malt backbone that holds up the pine, resin and grapefruit hops. Now that they have had their grand opening, you can visit and order pints directly. 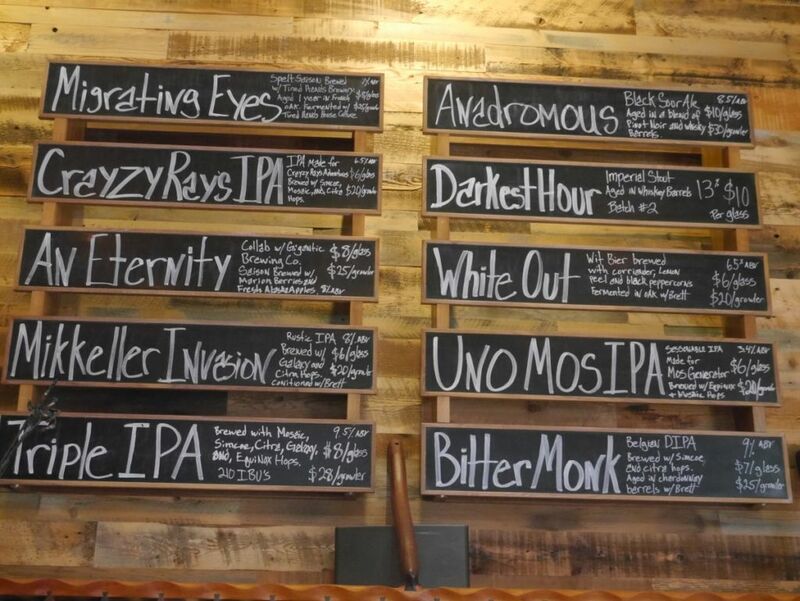 You can also find their IPA on tap around town in certain craft bars. 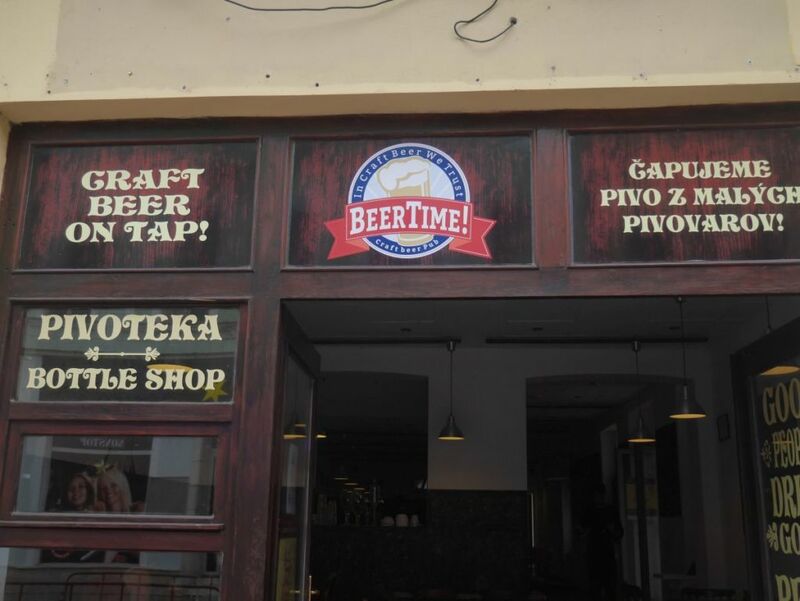 On my one weekend there we drove out to Nitra, a common attraction for tourists and visited a bar called Beer Time where beers flow so freely that four kegs were finished during the hours we sat drinking. The beers on tap were mostly from Czech Republic though I did get to experience a satisfying Slovak ipa called 15 years in hell. Beers were mostly under 2 euro 50, the price I would normally spend on a can at home. 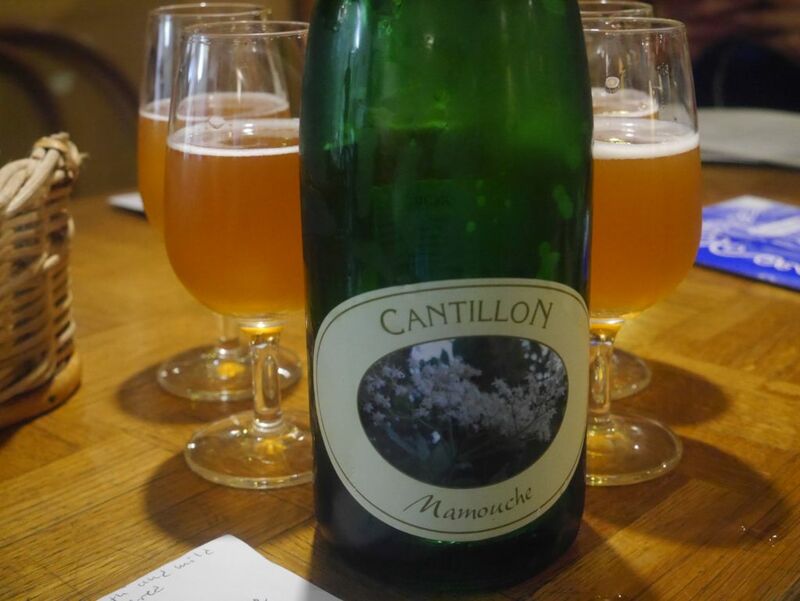 A sour option was more, almost four euros but still a steal. Our night of revelry complete with appetizers and later sandwiches was only 60 euros and would have been even less if the sour hadn’t been tapped. While I started with ipa my friend ordered round after round of a Rauch beer. I’m told that the typical American way of pronouncing Rauch generally means something you smoke like a cigarette whereas if you say it with the proper German accent it means something lightly smoked. Before the grill was fired up my friends enjoyed some meats. 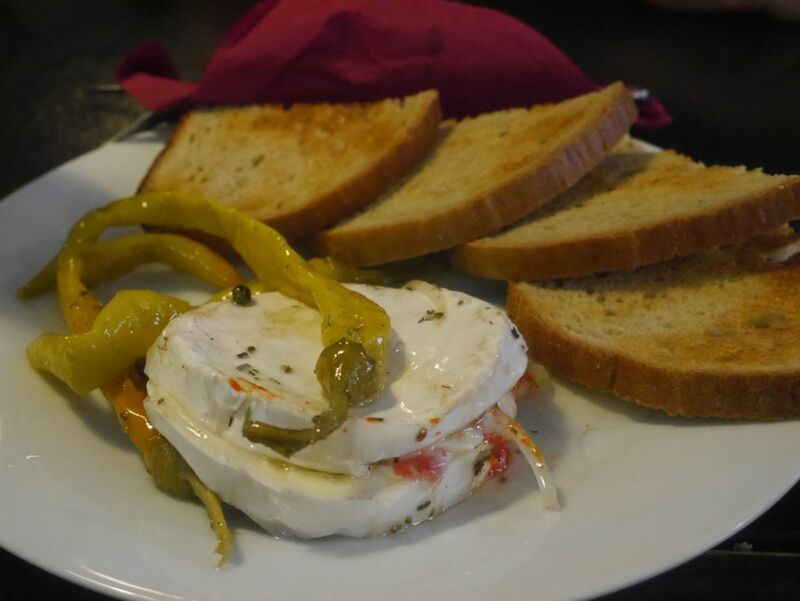 One had some head cheese and another some pate while I enjoyed a local delicacy of camambert cheese aged in oil with red pepper and served with fermented long green peppers. Eaten on toast it was fantastic. 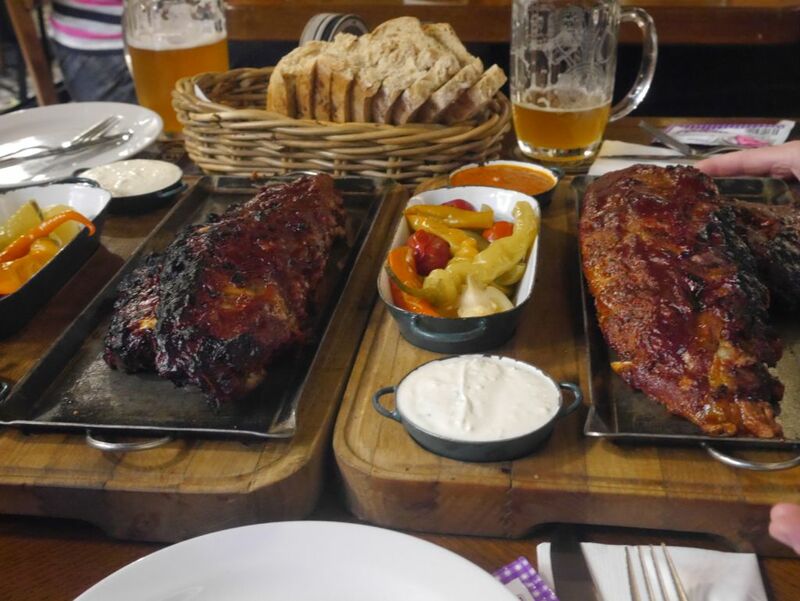 Though I’ve been eating vegetarian at home, few options exist to continue that diet here in Slovakia where meat is consumed in portions only dwarfed by the Germans. 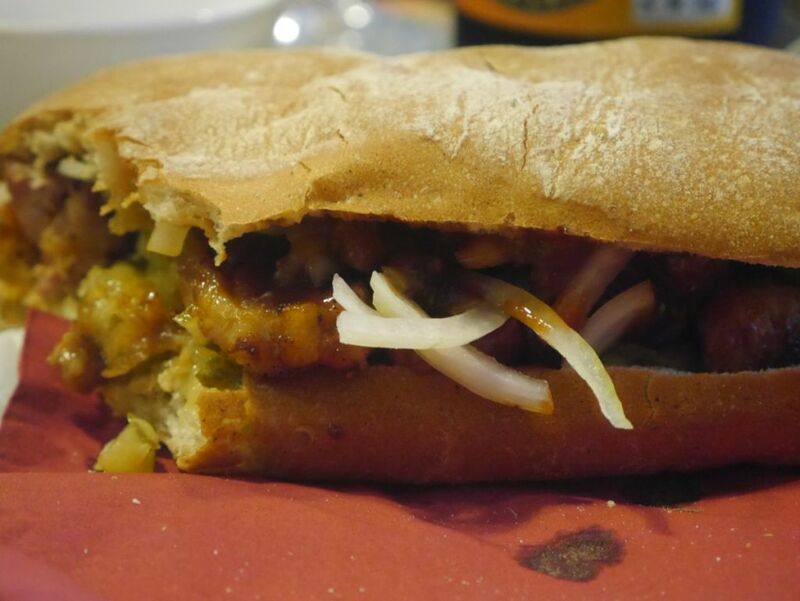 Meat and cheese are commonly served along with bread and pickles. I don’t mind a little cheat from my diet because we eat many meals at his home where he generally eats vegetarian as well. 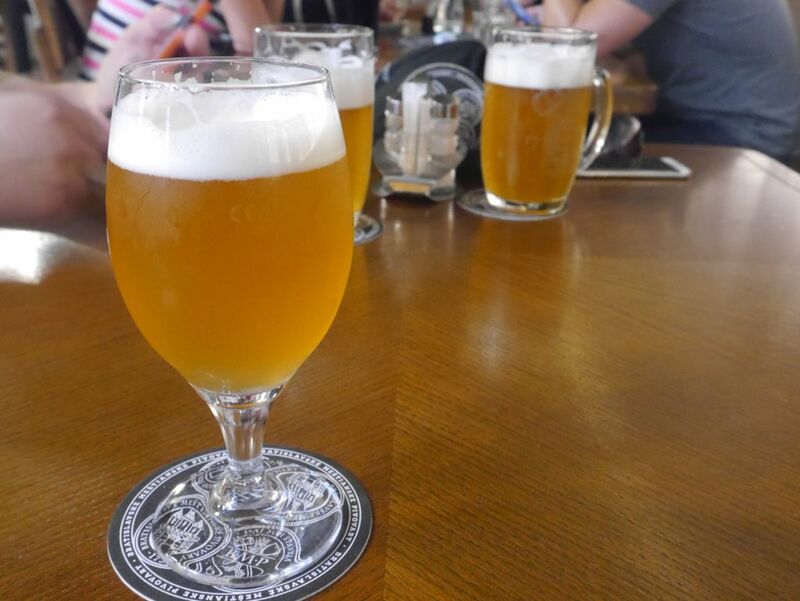 Richtar Jakub is a pub but also brews some of their own house beers. Their lager was described to me by my friend as the best lager in Bratislava. Though the batch on tap when we visited was a little off, I did really enjoy their session lager, the Anna, because it was quite clean and delicious. They are also a great place to visit if you want to taste some of the other local beers on tap. My other favorite place to visit during my trip was Supavar, a brewery that has a solid lineup of various styles of beer. Their IPA is a bit more malty than my preference but it was also very clean. This is the one consistent brewery in town. I ended up coming back a few times to have more of their delicious smoked porter. While it originally shocked me with the high amount of smoke, after a few sips I was able to enjoy the chocolate and roast notes that balanced it out. 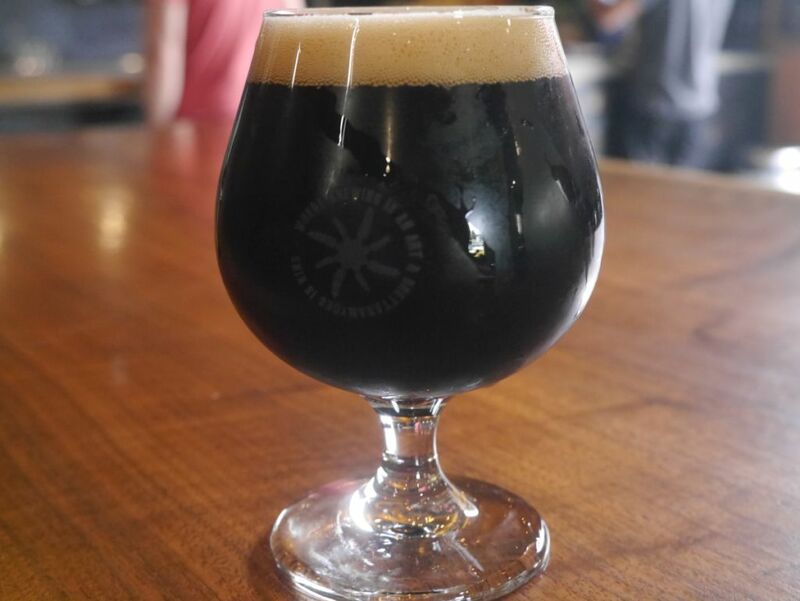 This is the closest thing to an imperial stout that you will be able to find from the local breweries. Despite the issues I had with a few of the local breweries keeping things up to the level they had reached before, I enjoyed the chance to experience more quality lagers. 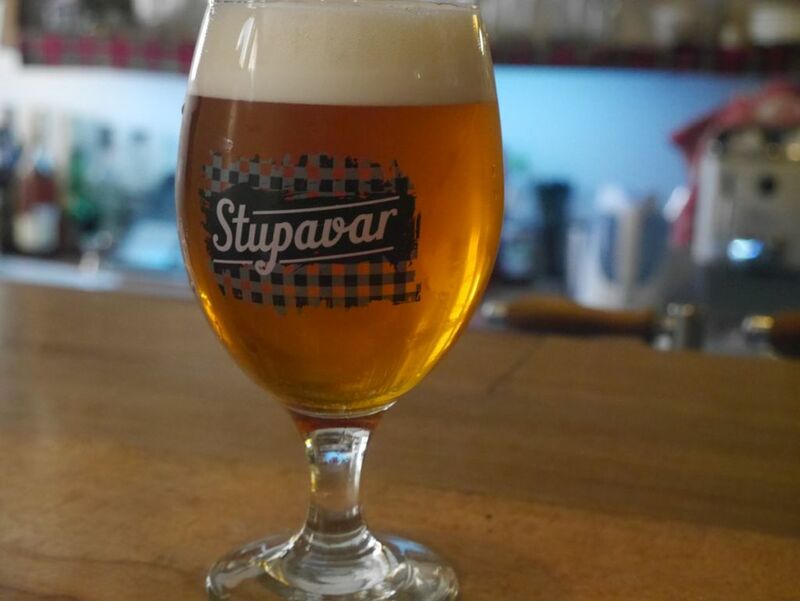 Stupavar and Mestiansky Pivovar are both places I would soon return to if I was back in the area. If you really can’t get enough of your local style of beers I suggest bringing some with you in your checked luggage. 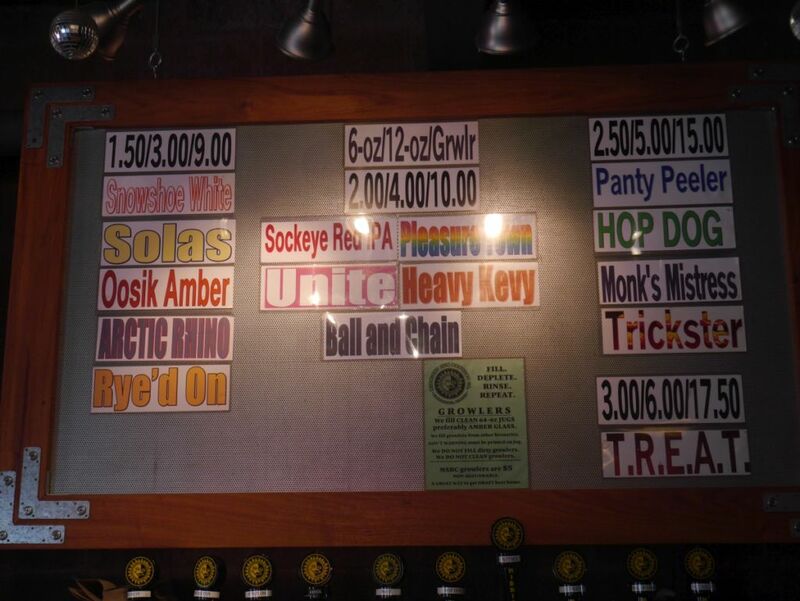 I shared a number of San Diego beers with my friends while I was out there.